In my time as a multi-sport coach and AD at various sized schools, I’ve often heard kids who are dropping one sport in order to “focus” on another. My response to all of those kids is simple. When college coaches speak to high school coaches, one of the first questions often asked is, “What other sports does he/she play?” I can remember college football coaches coming to high school basketball games to see our kids play, and there are often college coaches at high school track meets watching kids compete. - How does he/she move? - How does he/she work with teammates? - How does an athlete COMPETE? - What football coach wouldn’t want a kid to have the balance that wrestling teaches? Or the change of direction that basketball teaches? Or the hand-eye coordination that baseball teaches? Or the competitive drive that track teaches? - What hockey coach wouldn’t want that same hand-eye coordination from baseball? Or endurance from cross country or soccer? Or ability to explode from track? - What volleyball coach wouldn’t want the increased communication skills that basketball teaches? Or that same explosion learned from track? And I’m only speaking of sports that are offered in most schools, big or small. That endurance can come from soccer, cross country, swimming, or track. Hand/eye coordination? Not only from baseball or softball, but also from tennis, basketball, volleyball, and hockey. The ability to balance that I mentioned for wrestlers? Also a huge skill for gymnasts. Change of direction? Basketball, soccer, tennis, softball, volleyball, and football. The examples are non-stop. Outside of learning those skills and attributes across sport lines, how about being able to play for fun? As I’ve mentioned in a previous blog post (here), it’s extremely difficult to advance from one level to the next in any single sport. There’s a really good chance that middle school and high school are the last chances that athletes will have to play many different sports. If a kid enjoys playing a sport, middle/high school is the time to play it! I could go on, but you get the idea. In a future blog post, I’ll focus more on the detriment of sport specialization, but for now, I wanted to shed a little light on some of the positives of multi-sport athletics. 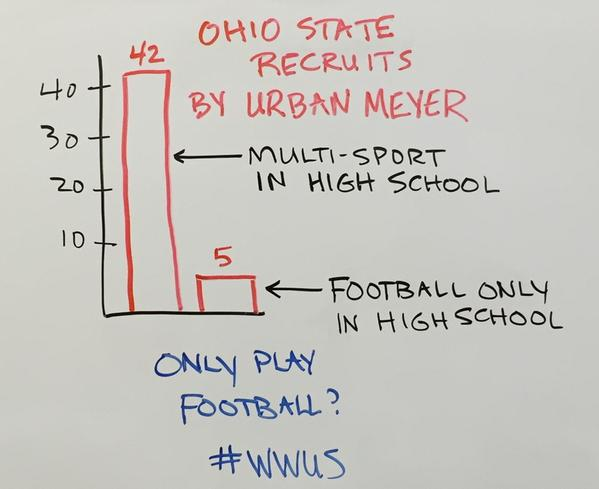 I agree its good a kid play multiple sports but coaches at the high school level have had some impact on this as well. What I mean is that when kid plays multiple sports its just not the playing of that sport for that season like it was back in my day. Today it means if you play football that coach wants you to be lifting whole off season to build up for next football season, basketball coach wants you to play the summer league, traveling teams, and of course the attend the open gyms in late summer and early fall; the baseball coach wants you to be throwing, doing weight lifting to strengthen and strectch your muscles for baseball skills and attend winter camp for baseball; and not to mention track and field coaches; or if you have wrestling coaches. So you see why the kids participating in sports start to reduce number of sports they play in and I think far to often number all together just quit sports. Also another thing which is quite common for number of the class b schools is they are cooped and kids are spending number of hours on buses just traveling to practice each week to play a sport. So you wonder why kids are not playing as many sports as in the past. I also think the number of kids that go on play college sports is very limited here in the state. The number that are recruited and receive large benefits in support for education is very few and if you look very few of these kids that are recruited are playing the sport by the time they are juniors and seniors. I am willing to bet that our music programs in high schools and academics give far more numbers and more financial support than do athletics do in the state but receive far less recognition to the public. I think we need to look at sports as activity as it was intended to be and use that as our goal to make sports fun and try to get greatest number of kids participating in sports quit trying to please colleges. The real true great athletes are going to get recruited no matter what. I like watching and following sports as much or more than anybody else but I also think we need to keep in perspective that it was started as activity for our students not for colleges, activities association, Coaches, media and anybody else that is receiving benefits from high school sports. I don't want to offend anyone because vast majority of people that are involved in sports are trying to do this but when one is competing we can loose sight of our original goals just because of competitive nature of sports. But I believe this needs to be addressed at higher levels of high school sports and educational leaders to find the right balance.